Today, HRC released a special tribute to the 49 victims of the Orlando shooting at Pulse nightclub on Latin night. The 18-minute tribute -- directed by Emmy Award-winning Ryan Murphy and Ned Martel, with the support of their colleagues at Ryan Murphy Television -- features a diverse cast of 49 actors, directors and other entertainment leaders recounting individual stories of the people killed in our nation’s deadliest mass shooting. 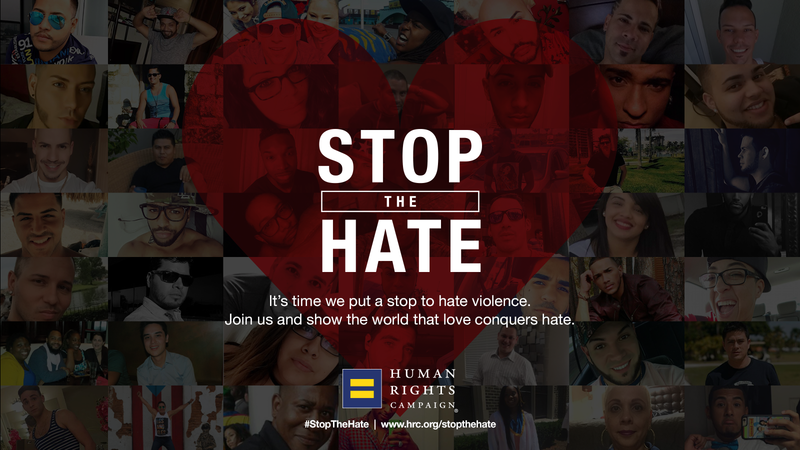 Viewers are asked to visit http://stopthehate.hrc.org and take action by supporting victims’ families and survivors through healorlando.org, as well as contacting legislators to demand passage of LGBTQ protections and common-sense gun violence prevention measures. The attack on Pulse nightclub has tragically become a symbol of how deadly anti-LGBTQ hate can become when it is combined with easy access to military-style assault weapons. In the wake of the attack in Orlando, HRC has been joined by a wide range of civil rights leaders in speaking out against laws and politicians who foment hate against LGBTQ people. HRC has also called on Congress to establish protections for LGBTQ people in all fifty states through the Equality Act and officially adopted a resolution in support of common-sense gun violence prevention legislation that will help ensure LGBTQ people and all Americans are safe and equal in every community. "The 49 heroes who lost their lives on June 12 were brothers and sisters, sons and daughters, friends and neighbors, boyfriends and girlfriends, husbands and wives. They were mostly young and mostly Latinx. But above all, they were human beings who were loved, and who had hopes and dreams for long, full lives," said HRC President Chad Griffin. "It has been only a few short weeks since we lost 49 people to a deadly act of hatred. It is our responsibility to keep their memories alive and honor their legacies by ensuring our nation acts to end anti-LGBTQ hate and gun violence. We are incredibly grateful to Ryan Murphy, Ned Martel and the 49 artists who came together to create this beautiful and lasting tribute." "The hate that stole these 49 individuals from all those who loved them has been allowed to flourish in our country for too long," said Ryan Murphy, Emmy Award-winning screenwriter, director and producer. "No person is born hating another, and we have an obligation as Americans to stand up against prejudice and bigotry that would incite violence against someone simply for who they are. I am proud to have joined with Ned Martel, my talented colleagues, and the Human Rights Campaign to honor these 49 heroes and stop the hate." Brief vignettes recounted by leading performers and entertainment leaders tell the stories of all 49 victims (in order of appearance): Jean Carlos Nieves Rodriguez, 27; Stanley Almodovar III, 23; Deonka Deidra Drayton, 32; Luis Daniel Conde, 39; Juan Pablo Rivera Velazquez, 37; Javier Jorge-Reyes, 40; Shane Evan Tomlinson, 33; Luis Daniel Wilson-Leon, 37; Jean Carlos Mendez Perez, 35; Alejandro Barrios Martinez, 21; Brenda Lee Marquez McCool, 49; Christopher Joseph Sanfeliz, 24; Franky Jimmy De Jesús Velazquez, 50; Juan Chavez-Martinez, 25; Jerald Arthur Wright, 31; Antonio Davon Brown, 29; Miguel Angel Honorato, 30; Anthony Luis Laureano Disla, 25; ‘K.J.’ Morris, 37; Edward Sotomayor Jr., 34; Frankie Hernandez, 27; Akyra Monet Murray, 18; Joel Rayon Paniagua, 31; Jonathan Antonio Camuy Vega, 24; Yilmary Rodriguez Sulivan, 24; Geraldo A. Ortiz-Jimenez, 25; Gilberto Ramon Silva Menendez, 25; Mercedez Marisol Flores, 26; Peter O. Gonzalez-Cruz, 22; Rodolfo Ayala-Ayala, 33; Paul Terrell Henry, 41; Xavier Emmanuel Serrano Rosado, 35; Tevin Eugene Crosby, 25; Amanda Alvear, 25; Eddie Jamoldroy Justice, 30; Angel Luis Candelario-Padro, 28; Simon Adrian Carrillo Fernandez, 31; Oscar A. Aracena-Montero, 26; Jason Benjamin Josaphat, 19; Leroy Valentin Fernandez, 25; Enrique L. Rios Jr., 25; Darryl Roman Burt II, 29; Cory James Connell, 21; Martin Benitez Torres, 33; Luis S. Vielma, 22; Luis Omar Ocasio-Capo, 20; Eric Ivan Ortiz-Rivera, 36; Juan Ramon Guerrero, 22; and Christopher Andrew Leinonen, 32. In the wake of the Orlando tragedy, HRC installed images of all 49 victims of in the front windows of its building in Washington, D.C., creating an 8-story composite image that also beared the message, "We Are Orlando.” The video tribute launched today -- and featured on HRC’s new microsite, http://stopthehate.hrc.org -- will be a lasting, living memorial to remember the victims of the attack. The site will also be home to news and resources about stemming the tide of hate violence against the LGBTQ community.